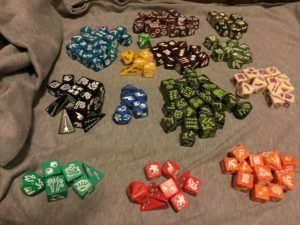 Full list of the individual dice below the cut. I’m not looking to sell individual pieces, only the whole set; best offer. Dice have already been sold, sorry! This entry was posted on Saturday, December 10th, 2016 at 2:04 am and is filed under General Topics. You can follow any responses to this entry through the RSS 2.0 feed. You can leave a response, or trackback from your own site.